Jo Tinsley’s passion for slow travel, long rambles and sea swimming has sent her all over the globe. 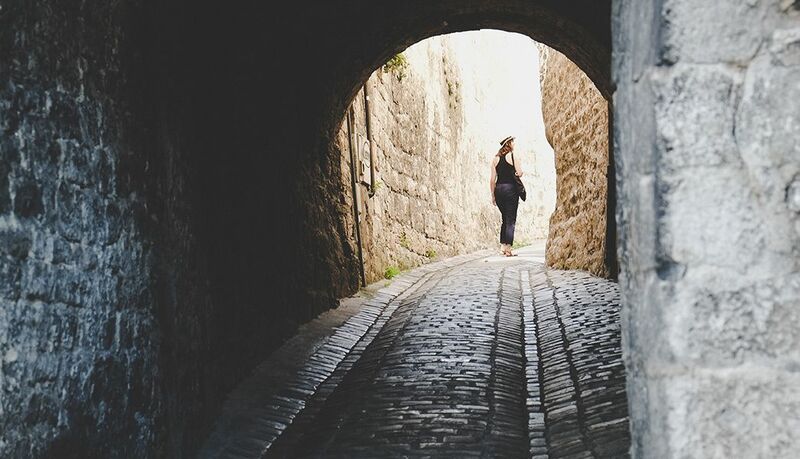 This summer, she road-tripped through Jura, a relatively unknown region in France, discovering remote lakes, medieval villages and thriving wildlife. The Jura Mountains are a 360km arc of sub-alpine hills stretching along the French-Swiss border. It’s a truly untamed landscape, more rounded than the rugged Alps but wilder, its dense forests home to lynx, boar and deer. 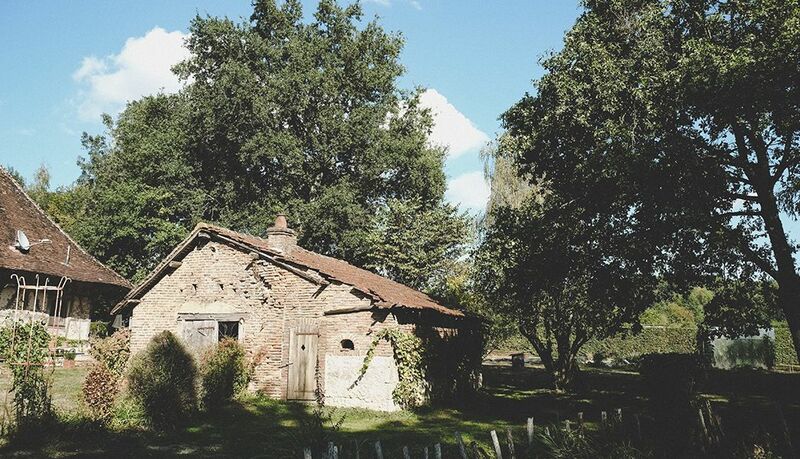 It’s a region overlooked by tourists: an off-the-beaten-track corner of France, even for the French. St Pancras, early morning. One moment I’m balancing my passport on top of a takeaway coffee and shuffling through security, the next squinting into a soft grey morning in France. Hazy clouds hang low over striped farmland and plumes of dust billows around a tractor beneath the slow revolutions of wind turbines. 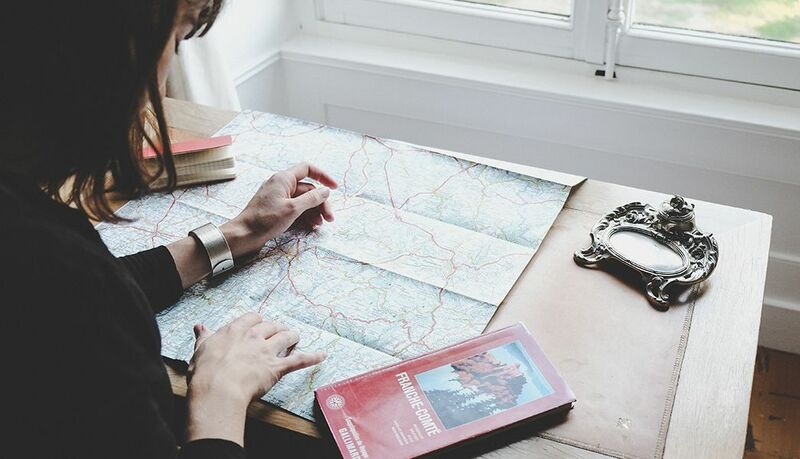 By lunchtime, my partner and I have picked up a car from Lyon and I’m dropping croissant crumbs on a map of Jura, the little-known region we’re setting out to explore. As slow adventures go, this one has got off to a speedy start. 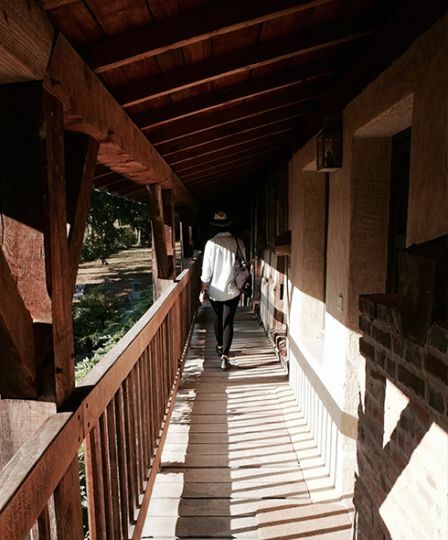 We take a pre-dinner stroll to the nearby lake and find it’s brimming with life. There are tiny green frogs around the pool’s edges and hoof prints suggest wild boar are regulars, but I’m most excited to see tunnels of grass that suggest an aquatic mammal has slid into the water. Scanning the lake’s surface for the tell-tale ‘V’ of an otter we catch sight of a coypu – a breed of South American rodent that escaped France’s fur farms in the 30s – which swims over to nibble on some water lilies. Over dinner, we regale a young French couple and four Brits with our nearly-an-otter sighting. Marie’s husband Dominic presents the cheese board – bearing Comté, Morbier and Mont d’Ord – and the guests’ shared passion pushes through any remaining reserve, each of us taking turns to boast each of our region’s finest dairy products. 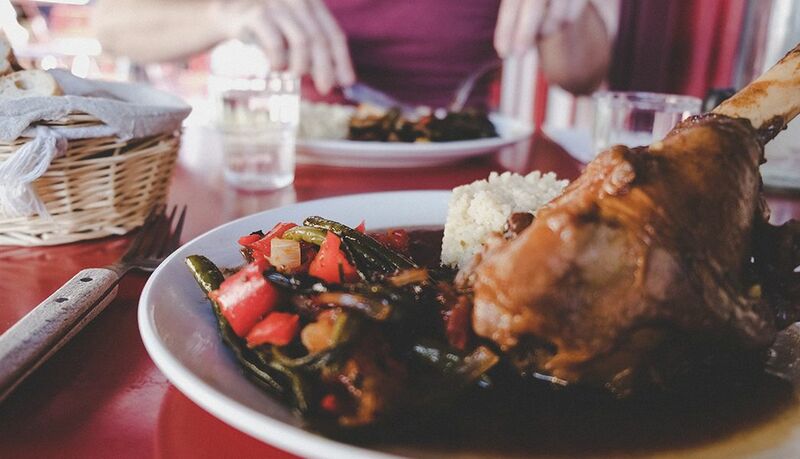 Watching my fellow diners chat animatedly, I understand the appeal of the table d’hôte tradition – the simple joy of sharing food with friends and strangers. Marie looks on contently from the kitchen. There are tiny green frogs around the pool’s edges and hoof prints suggest wild boar are regulars, but I’m most excited to see tunnels of grass that suggest an aquatic mammal has slid into the water. 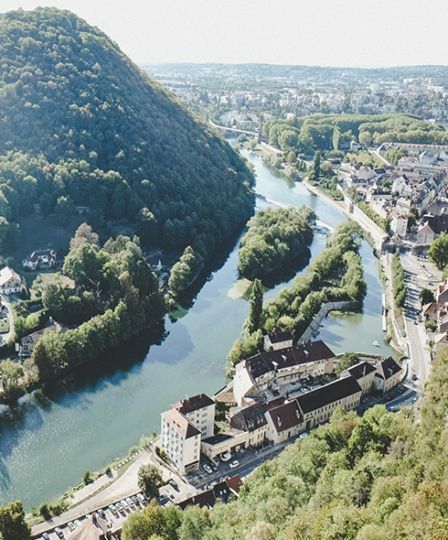 The following day, we’re on the backroads to Besançon, the region’s unassuming and eccentric capital – and France’s principle watch-making city – which nestles in a loop of the river Doubs. I follow a line of visitors up well-worn steps in the Cathédrale Saint-Jean to gawp at Besançon’s astronomical clock. I’m not the only one. 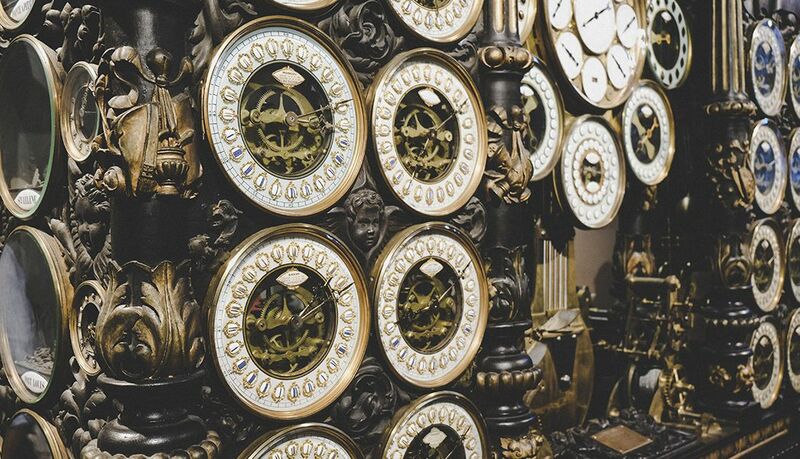 Measuring an incredible 2.5m x 5.8m, the clock fills the room leaving just enough space for us visitors to shuffle around and peer at its 30,000 moving parts, 70 dials, the tide times of eight French ports and 21 automata. Just as curious is the old citadel. With a built-in zoo, insectarium and 132m-deep well powered by a human hamster wheel, it’s certainly one of the quirkier UNESCO World Heritage Sites. 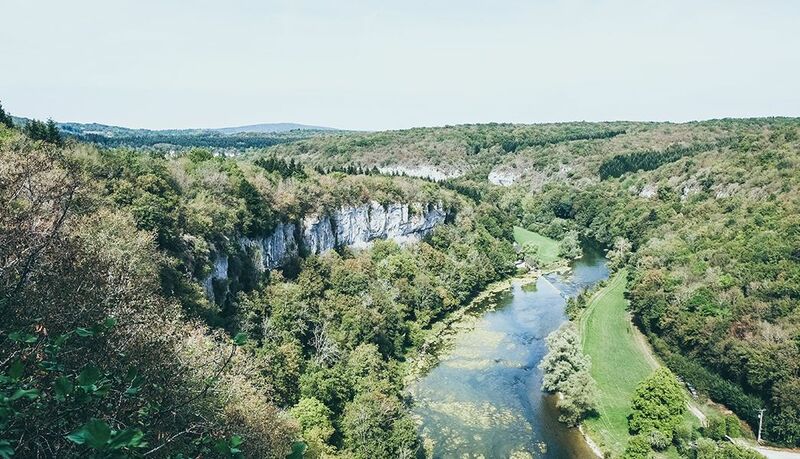 South of the city, near the source of the river Loue, the landscape folds into thickly-wooded valleys where water has carved the porous rock into deep gorges. 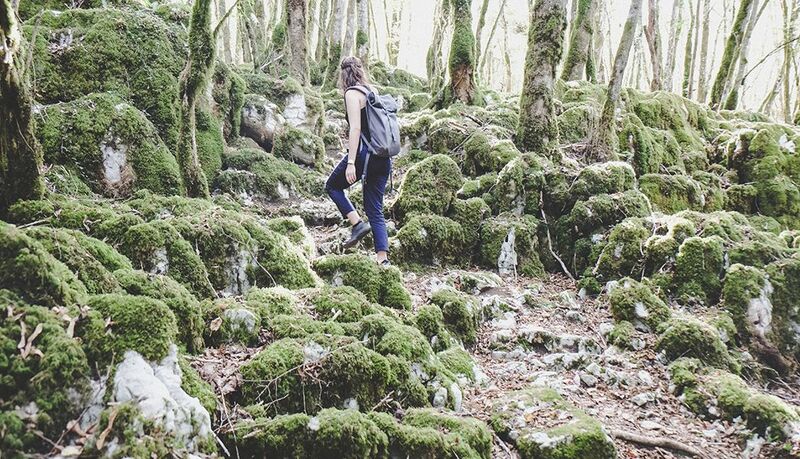 Picking up a hiking trail, we find an area of limestone pavement: white boulders scored with fissures look like they’ve been pushed through the earth then rolled in moss and lichen. 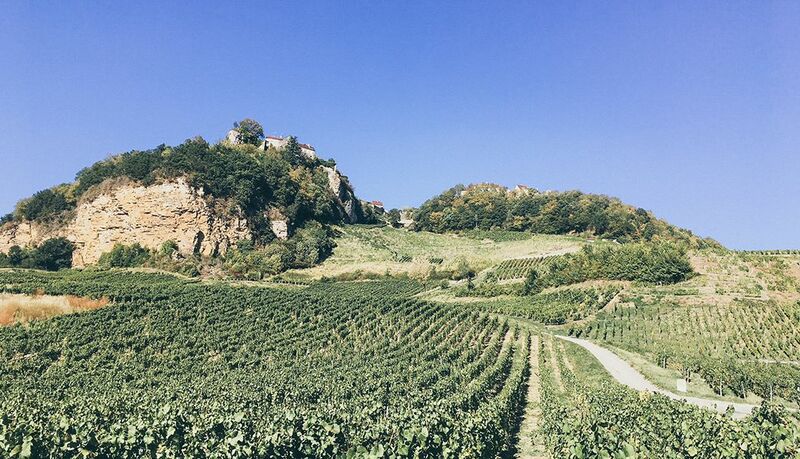 Arriving at the hilltop town of Château-Chalon, perched like a lighthouse above waves of rolling vineyards, it becomes clear we’ve lost track of time when requests for lunch are met with apologetic head shakes. 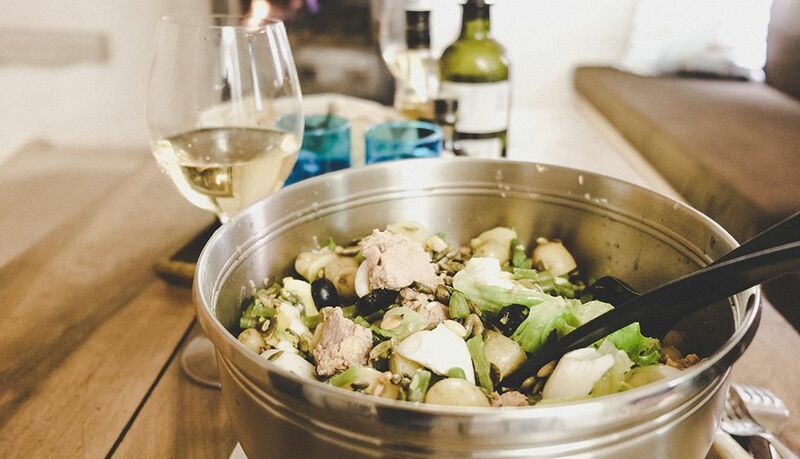 Then we happen upon Les Pupitres de Céline, a delicatessen where you can stay and eat what you buy. We recline in Céline’s sun-trap of a terrace and set about filling baguettes with local cured meat washed down with a glass of vin jaune (yellow wine). 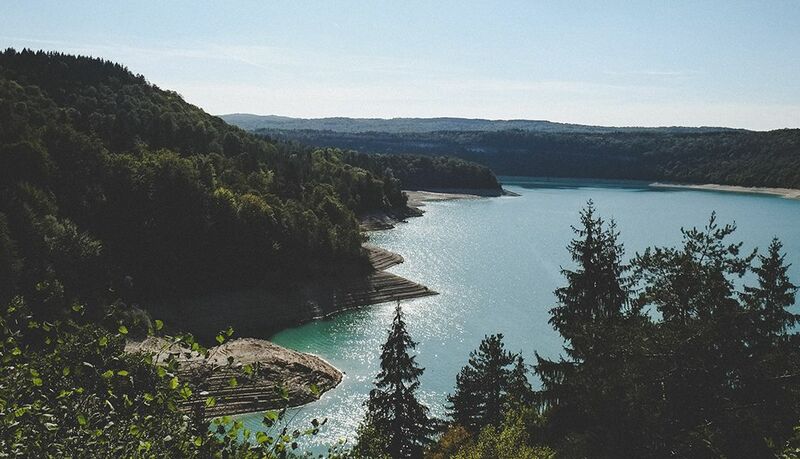 East is Pays des Lacs – Jura’s lake district – where imposing limestone peaks enclose teal-blue pools. 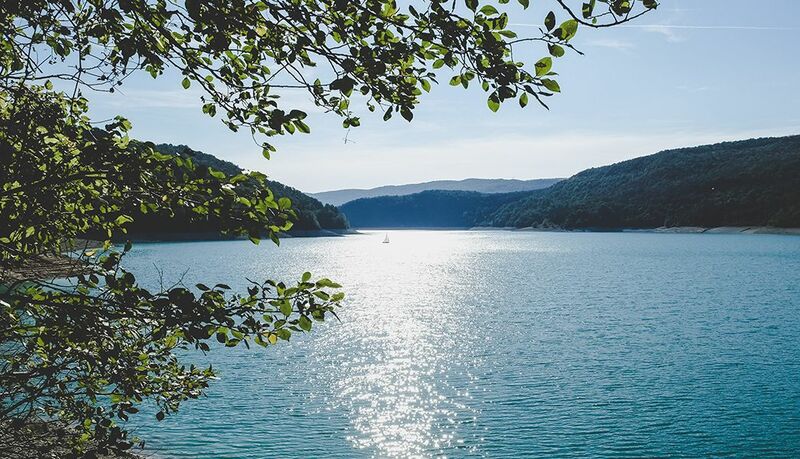 A handful of families are packing away picnics when we arrive at Lac d’Ilay, a wide lake backed by a tree-fringed escarpment, and laughter drifts across from the opposite bank. I wade in over smoothed pebbles and make for the opposite bank, staring down into the depths. On the return stretch, chilled by the water, we swim around the lake’s warm, shallow edges, pausing to loop through a submerged forest of reeds. It doesn’t take long for the resident tawny owl, Denise, to start making a racket and we follow the sound to see her looking down at us from a roost in the castle chimney. Hers aren’t the only twilight noises: there’s scuffling behind walls, and I can’t help but feel watched. Lynx are crepuscular creatures, and as I shine my torch across the lawns I half expect to see eyes glinting in the dusk. The following morning, sunlight floods into the pigeonnier. Denise has returned to roost, her calls replaced by those of squabbling song birds. 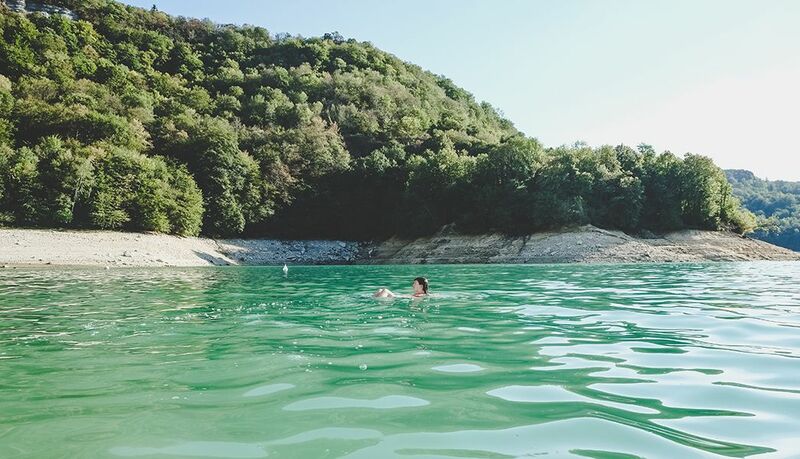 We pack a picnic and head to Lac de Vouglans, a serpentine lake whose eastern bank is dotted with secluded turquoise bays. Setting off to a deserted beach, I suddenly find myself in a cloud of white butterflies, which cling to my arms and shoulders as I make my way down to the water’s edge: an unexpected last dip in the untamed Jura. Jo took the Eurostar from London St Pancras to Lyon-Part-Dieu. From here, she made her way to La Ferme de Marie-Eugénie in Saône-et-Loire. 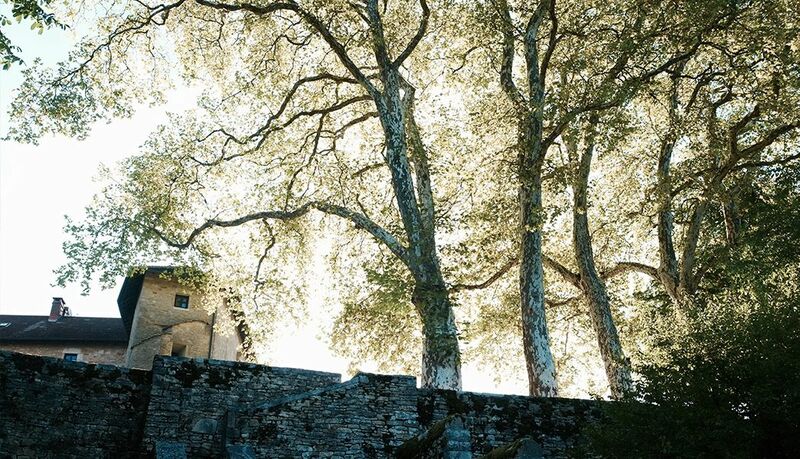 Next, she drove to Besançon and then on to her second accommodation, Les Egrignes in Haute-Saône. From here, Jo headed down to Château-Chalon and then onto Lac d’Ilay. 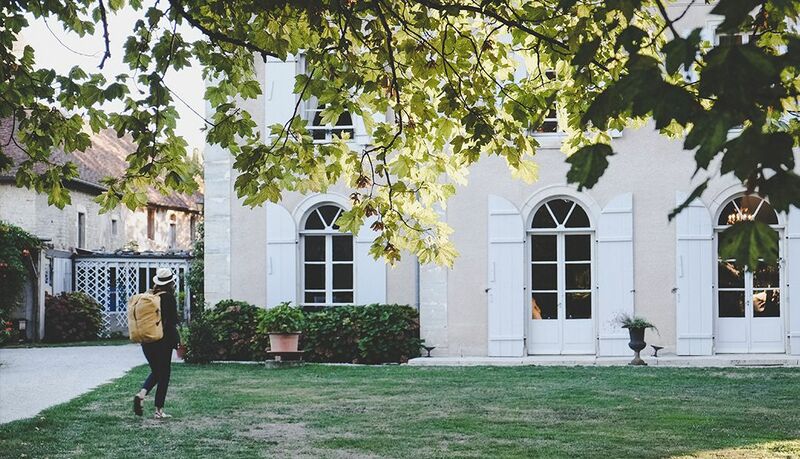 For the next two evenings, she stayed at Le Château Marigna in Marigna sur Valouse. 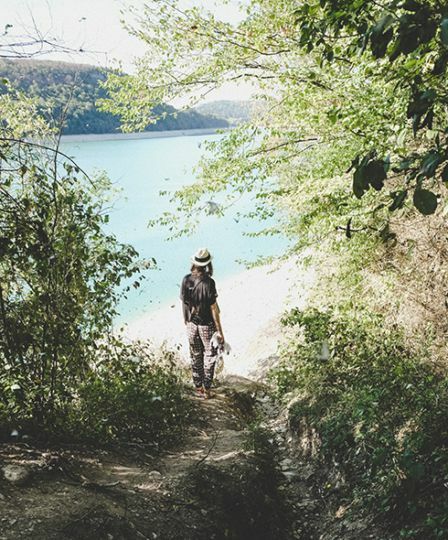 On her final day, Jo explored Lake Vouglans and the nearby village of Baume-les-Messieurs. Before heading back to Lyon to catch her train home.